GameStart 2015 might be a loud and thumping affair with AAA publishers wowing convention goers with giant screens, replica castles and swag giveaways but locally developed games were also under the spotlight in the form of the Singapore Gamebox and GameStart’s Founder Base. The Singapore Gamebox is an incubation centre for game developers based locally and it’s an initiative by the Media Development Authority and managed by Nanyang Polytechnic – yes, the government will now help with your dreams of being a indie game developer. GameStart’s Founders Base was a special section of the convention hall dedicated to individual, start up or small company that creates or works with games to showcase their work. Valiant Force is an upcoming turn based RPG developed by XII Braves for Andriod and the iOS. Turn based RPGs are a dime a dozen in the mobile market, with tons of indie developers just cranking them out with each being indistinguishable from one another. Valiant Force might look like some random mobile RPG from the get go but once you dive into the game, it’s nothing like your average app store RPG. Just the myriad of gameplay features in the game would beat the other run of the mill mobile RPGs flat. The stylized visuals of the game was very evocative of Final Fantasy sans the 2D sprites, as the game is played out entirely in 3D. Battles are played out on two 3×3 grids where your units would face off against the enemy in a turn based battle system, there is an additional layer of strategy involved as weapon range and unit placement becomes integral for survival because each individual unit would have his or her own unique passive and active skills which could only be used when in range. Valiant Force would feature 6 base classes with each class being able to evolve into more specialized classes. The game also features a garrison system where players would be able to build and manage their own garrison which would provide players with abilities such as crafting and resource creation depending on what he decides to build. Valiant Force is slated for a early 2016 release date on Android and iOS. Monster Chronicle is a monster collection/battle game with a twist but instead of just pressing a button and watch the battle play out, battles would play out on a 3×3 grid in a style similar to everyone’s childhood favorite game Tick-Tac-Toe. To simply imply that Monster Chronicle is just glorified game of tick-tac-toe would just simply be erroneous. Just beneath the simplistic premise of its battle system, lies a deep and engaging system of strategic placement as lining your monsters in row would result in special abilities that could turn the tide of battle. Outside of the battle system, a rearing system similar to tamagochi is currently in development. Players would also be able to breed and customize their monsters to give them an edge in battle. Monster Chronicle is simplistic fun for all ages with the game’s expected release in the middle of 2016 for iOS and Android. Battle Spheres is a sling shot game with developed by ixora Studios where battles takes place in a arena with the player flicking his monsters around in order to attack the enemies on screen. The game plays out very similarly to a game of marbles where single flick would change the game board dramatically. The depth of the game is fully explored when you factor in each the abilities of each individual character, each flick felt like a mind boggling equation to try and maximize the damage I could deal. Battle Spheres is a straightforward game that one could easily pick up, while its strategic depth would keep you playing. For me it’s nearly as addictive as candy crush. Battle Spheres is currently available on iOS and Android. This locally developed isometric RPG had won the Best Indie Game award at this year’s Tokyo Game Show, beating out developers from all around the globe – I’m just going to give you a moment to that let that sink in. The game is set in a Venetian-inspired fantasy city called Ombre governed by a class of elites called the Masquerada who are owners of rare masks which enables the use of magic, through the use of their masks, they are able to oppress the citizens of Ombre. The player character part of the Masquerada but an investigation into a kidnapping threatens to shake the very foundation of the city. According to executive producer Brian Kwek, Masquerada would be a 12 hour journey with very little side distractions as they don’t want players to focus purely on the main story arc. The visual aesthetic itself was very reminiscent of French comics or more recently Banner Saga. The environments look absolutely stunning and even the effects from spells looked like they popped out from a comic from Image. The combat is evocative of Dragon Age where the player would be able to control a single character in real time but you’ll also be able to freeze time and give individual commands to characters. Not only does the game look great, it would also sound great as developers Witching Hour managed to get some great voice actors to provide VO for the game. Some of the cast include Jennifer Hale (Female Commander Shepard, Mass Effect), Matthew Mercer (Chrom, Fire Emblem: Awakening) and Dave Fennoy (Lee, The Walking Dead). It’s a great game for lovers of RPGs, Masquerada is slated for a Spring 2016 release steam with the console version coming a few months later. What do you get when you cross Deck Building with Real Time Strategy, you get Arma Gallant. This deck building RTS developed by Arma Gallant seeks to bring together card game enthusiast and RTS lovers into the same battlefield. The objective is to reduce the health of your opponent by capturing strategic objectives placed on the map with units summoned from your deck and if monsters are not enough, you can also cast spells from your deck to unleash hell on your opponents. Players would need to think about their deck build because a jack of all trades is a master of none. Do you go fast and cheap to overwhelm the enemy with sheer numbers or do you bide your time until you can unleash your giant high level creatures. The game would feature over a hundred cards and five elements, I’m already getting deja vus of my Magic The Gathering days. Arma Gallant is slated for a late 2015 release on the PlayStation 4. One of the core pillars of interactive entertainment is sound and no one does it better than IMBA interactive. A all in one studio for everything auditory, everything from original music to sound design, heck they can even implement their work into your creation. Their works are featured in games such as Daylight Studio’s Holy Potatoes! A Weapon Shop and in the upcoming RPG Masqerada: Songs and Shadows. In addition to games, IMBA also does everything audio related for your videos,they are also the official audio post-production partner of local Youtube channel Night Owl Cinematics. So if you’re looking for an amazing studio for all your auditory needs, look no further than IMBA interactive…they are in Singlish really Pao-Kah-Liao! As a normal functional human being, we all need clothes but as geeks we need clothes that showcases our favorite slice of geekdom. Xmashed Gear is here to fulfill all your clothing needs with their line of gamer apparel. I’ve recently interviewed the founder of Xmashed Gear, read it here! They deliver the shirts right to your doorstep so you don’t even have to leave your house. 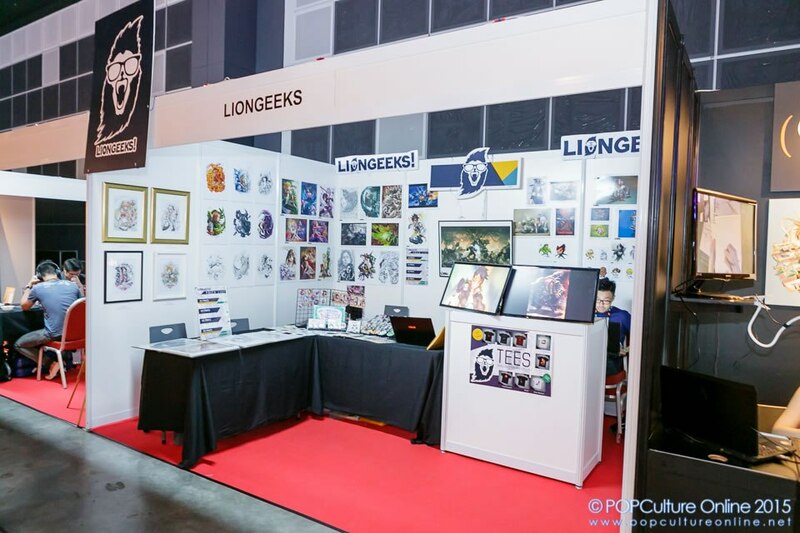 Liongeeks is the shop to your prints and items with some excellent artists creating pieces of artwork that would fit well in your everyday geek’s walls. Not only are the prints great looking but they are also reasonably priced. My personal favorite was the giant print of Warhammer 40K with my favourite UltraMarines and Orks slugging it out on a bloody battlefield.